The Interceptor 8050 is KUHN Krause’s high-speed tillage solution for controlling troublesome, chemical resistant weeds and a whole lot more. Developed to provide a clean width of cut, the Interceptor 8050 provides growers with a smooth seedbed floor and a level surface for accurate seeding. 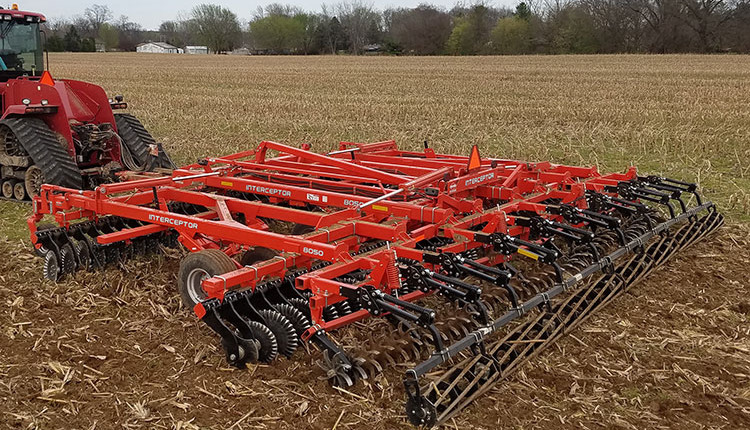 A single row of heavy-duty, adjustable, 30” tines are mounted directly behind the front row of 32-flute Excalibur® CT (Conservation Tillage) blades forcing “airborne” material downward toward the field surface. This begins the soil leveling process and aids in evenly distributing residue ahead of the transport wheels, rear blades and the proven Star Wheel™ treader rear attachment. No daily grease maintenance features, along with speed of operation can improve operator productivity. Designed for growers who prefer a high-speed tillage product with a more aggressive nature, the Interceptor 8050 can meet expectations. Two parallel rows of 22” diameter x 32-flute Excalibur CT shallow concavity bladessize and evenly distribute tough residue into the worked soil profile. A 6-bolt hub mount secures each Excalibur CT blade to individual blade arms formed with compound angles to direct soil and residue flow from the Excalibur CT blades. A high-speed tillage pass with the Interceptor controls stubborn, chemical resistant, young weed growth. 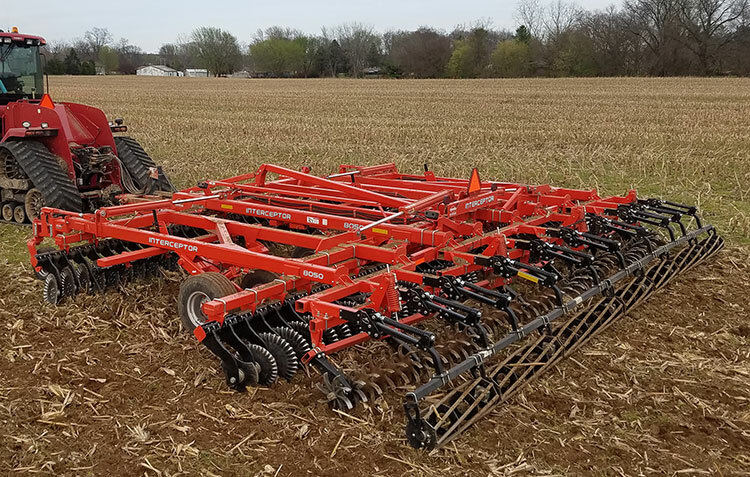 The Interceptor high-speed tillage system has the potential to increase the adoption of higher planting speeds in both conventional and conservation tillage systems. Adjustable, constant-flow hydraulic wing down pressure allows the KUHN Krause Interceptor to maintain consistent soil penetration across the working width, while operating at higher field speeds; a first step toward accurate planter seed placement. Additional standard features include: no daily grease maintenance bearings for the Excalibur CT blades, walking beam pivots, wing fold and wheel lift pivots, plus Star Wheel treader gangs and 24/7® HD conditioning reels. The Interceptor is available in 20’, 25’, and 30’ sizes.